Hi all. My name is Justin Akiyama. I'm very much so a newbie in the field, but graduated from The Art Institute of California - San Francisco. This is my first challenge, ever. I am excited and more than a little nervous. So, let's get to it! So my idea for this render was to do an OC, with PBR/realistic textures in a Sci-Fi theme. 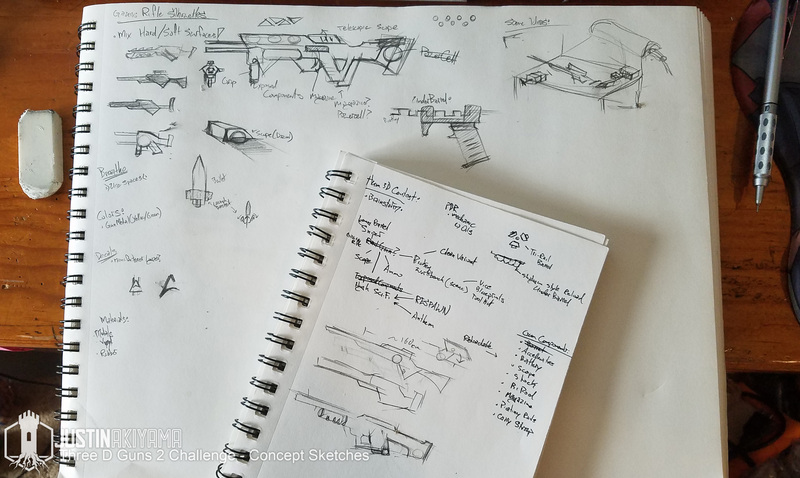 I settled on a Gauss Rifle because I wanted to do a long-barrel weapon, but also do something iconic to the Sci-Fi genre. For this challenge, I will be sharing my progress here (and muuuuuch earlier in the process than I am use to), so feel free to contribute feedback as you'd like! Any/all is appreciated. This gun should look like it hurts. And from a long ways off. 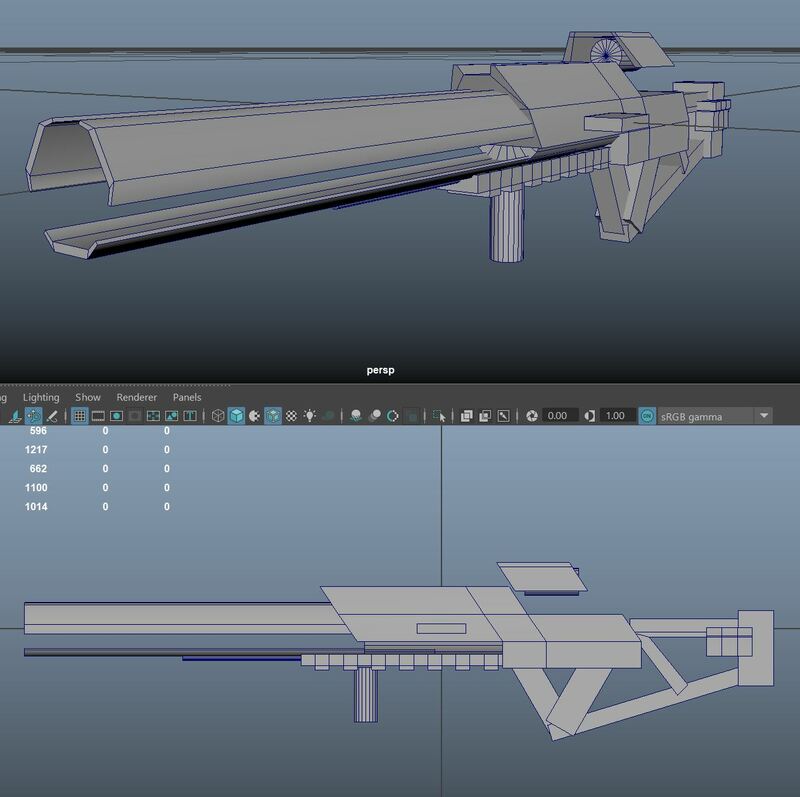 I'm hoping that this gun will look like a sniper's weapon from some sort of Covert Ops specialist's inventory. Long range, high accuracy, but mobile enough for guerrilla warfare tactics style deployment. While I have a deep appreciation for the super sleek, streamlined Sci-Fi styles, I want this gun to be a little more rugged. Having more utilitarian, heavy shapes and lines, I want this to look more "Terran" than "Protoss". Other comparable IPs would be: Respawn's Titanfall, BioWare's Anthem, with a splash of Gundam thrown in. I like how grounded/realistic and heavy this style looks and will do my best to emulate this. I'm going to try and keep it simple and clean. 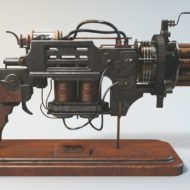 I want to do a workbench set-up, with the gun under some maintenance. I'll scatter tools, ammo, etc on the work surface and have more permanent features (like lamps and vices) mixed in. 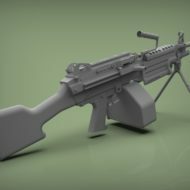 This should let me get in relatively close to the gun itself for the render, and justify my lighting comp. I'm also toying with the idea of including a mock-up of the weapon's "blueprint" being in the scene (maybe as a workspace mat?) 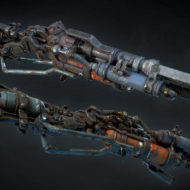 to double down on the whole engineer/sniper character that owns this weapon. Intending on a Med-Hi-Lo pipeline. 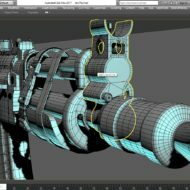 Maya for most of my modeling with Zbrush (Hi Poly), Substance Painter (Texturing) and Marmoset Toolbag (Baking and Render). Okay, and finally, here are my preliminary sketches! 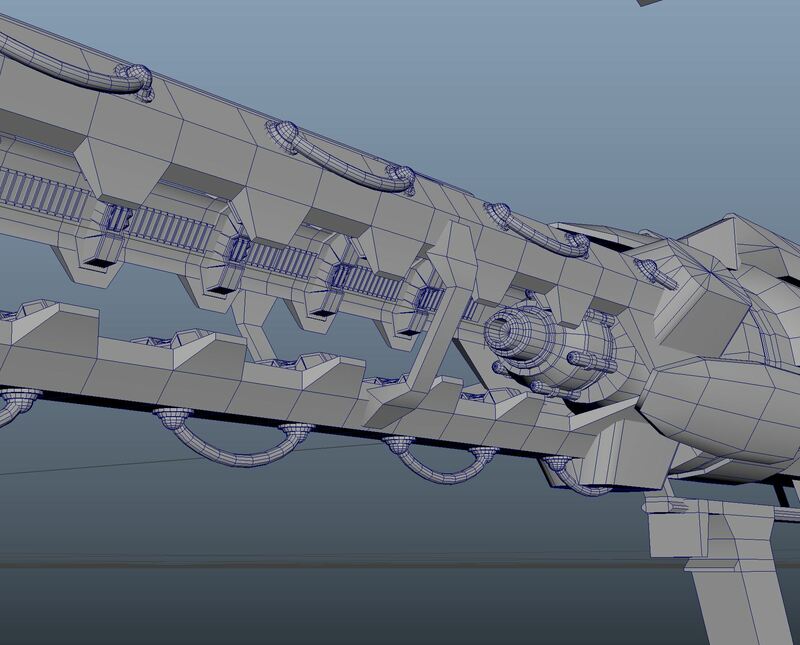 Today, I'll be doing some Lo-Poly block-out studies in Maya. I'll post the results when I'm fairly happy with them! Settled on some basic blockouts. I have all the core weapon components in place (and roooooough ratios). Heyo! Progress was a little slow this week because I kept changing my mind about design aspects... (Almost like modeling without good references makes life harder, no?) Trying to keep things 'asymmetrically symmetrical' so that there's visual interest from all sides. I know this contest is for a single rendered image, but making a completely symmetrical object seemed... boring. Tried to work in a variety of materials (tubing, wiring, plating, , plastics/rubbers, nylon/vinyl) and am planning on using them to accentuate force lines. 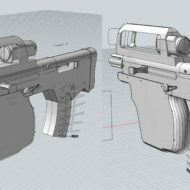 Also managed to work in two Picatinny rails, but only plan on making the under-barrel grip attachment at the moment. - Stylistic Concept: am I on target? 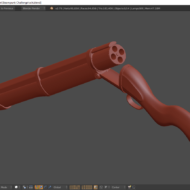 - Proportions: Does this gun look useable? Are certain components need to be resized? - Color Palette: I have three different sets currently. I need to pick ONE. Which? - Tertiary Details: How much, and where? (Clasps, Latches, Sling mount(s), Exposed wiring, etc) Still very undecided here. Next up: Start getting Boolean Meshes together for the parts I do like, and keep iterating on the parts I don't, till I do.